In their last action before adjourning at 12:35 a.m. Tuesday, Miami city commissioners approved a $10.1 million funding plan for the environmental remediation of a half-dozen contaminated parks. The move came after Commissioner Marc Sarnoff had pushed the administration to find a way to clean up and reopen Douglas Park, one of the largest in the city and located in his district. Mr. Sarnoff was proposing the city seek a hefty federal loan, but some fellow commissioners were worried that that plan would take funds from their districts in years to come. At their Sept. 11 meeting, commissioners directed City Manager Daniel Alfonso and staff to explore funding options for the remediation. At the close of this week’s marathon session, Mr. Alfonso presented the commission with a plan to use revenue from special obligation bonds to pay for the costly remediation. Commissioners liked what they heard and preferred it over seeking the loan. “We shouldn’t continue to debate how we’re going to solve the problem at Douglas Park,” Mr. Sarnoff said, just before the vote on the $10.1 million funding plan. For a half-dozen parks, and the families and children wishing to play in them, the summer of 2014 was lost. Most commissioners have expressed frustration at the time it is taking for remediation of the parks so they can be in use once again, and lament the barrage of complaints from residents about lack of green space and park land behind locked fences. Douglas Park, at 2795 SW 37th Ave., has been closed nearly a year. The estimated cost for environmental remediation at Douglas Park is $3.3 million, Mr. Alfonso told commissioners. In late 2013 and early 2014, the city investigated the environmental status of its parks and discovered some contain contamination in soil below ground. The city conducted environmental status evaluations at 112 parks due to contamination discovered at Blanche Park while testing soil within a 1-mile radius of the former City Incinerator #2 that operated in Coconut Grove. During the environmental status evaluation via visual park inspections, historical aerial photographs and viewing archived city files, several locations were suspected of former landfill operations prior to conversion into parks, city officials said. Soil was tested at each park of concern, and eight were confirmed to contain a combination of solid waste debris and heavy metals at levels that exceed the Miami-Dade Cleanup Target Levels for the Residential Threshold. The state requires the city to remedy environmental hazards on any property it owns. Facing a huge bill to remediate the parks, city commissioners this year designated the contaminated properties as Brownfield sites, with the hope of applying for transferrable tax credits that can be sold. 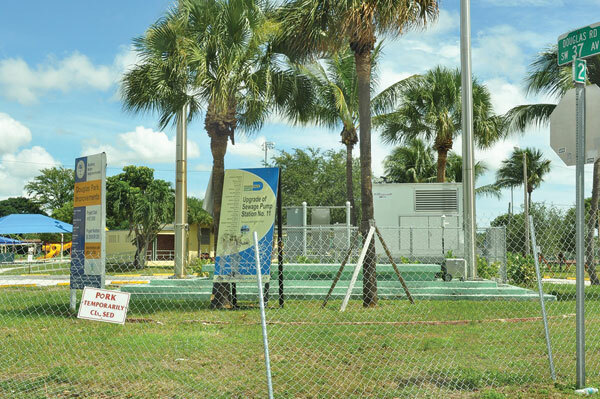 Two of the city’s impacted parks, Curtis and Bayfront parks, are within the existing City of Miami Designated Brownfield Areas. Ken Russell, who lives across the street from Merrie Christmas Park and has three young children, wants the park reopened but not until it’s safe. The city’s plan – approved by county environmental officials – is to spread out the contaminated soil at Merrie Christmas Park and cover it with clean fresh fill material. Mr. Russell told Miami Today he is not satisfied with the city plan to spread and cap the contaminated soil. “The decision they’re making is frustrating… they’re not removing the toxic soil but instead spreading it around the non-toxic areas – they’re going to move the poison to areas where it isn’t,” he said. There is no point in opening the parks quickly if the remediation isn’t done correctly, said Mr. Russell. “I don’t care how fast they open it, if they open it and it’s still poison,” he said. I have been a homeowner to this duplex for over 25 years, as the years goes by Douglas Park it’s turning out to be worst, in delinquency, our youth smoking pot, drinking, etc, and I have witness all of these right behind my florida room, (unfortunately, my house it’s right there adherent to the park), by the way as we know to this enormous tree that serves as a restroom too… I’m tired, of my serious complain to the City of Miami Park and Recreation, to City of Miami, which also I will like to mention this tree has cause many damage not only structure to my house foundation, as we are aware as is visual, (tiles are crack, floor are lift, etc, ect, ect. But many years ago the curiosity of a child, made him climb the tree, he felt, and placed him at intensive care unit at Miami Children Hospital in a coma for weeks, he suffer severe head trauma, and consequently had head surgery, ( This tree, has no fence to avoid our kids to go into it, nor did they ever took care to look into this, although they even had a child care program right at their premises – Douglas Park Pre-School as a matter of fact they would bring the kids to play, and eat their snacks under the tree shade & exercise ).. That Kid, was my son, I know they will ignored my petition, just like they ignored it back then. Until one day. What about Margaret Peace Park?? That is a huge DOG TOILET PARK…i live in the area and i am allergic to dogs….i can’t go to enjoy the grren areas and the intracostal view because people don’t respect the designated dog areas…all the park is full of dog poop and urine…and when you pass near the garbage containers the smell is so horrible and hundred of flies are around…so sad! !